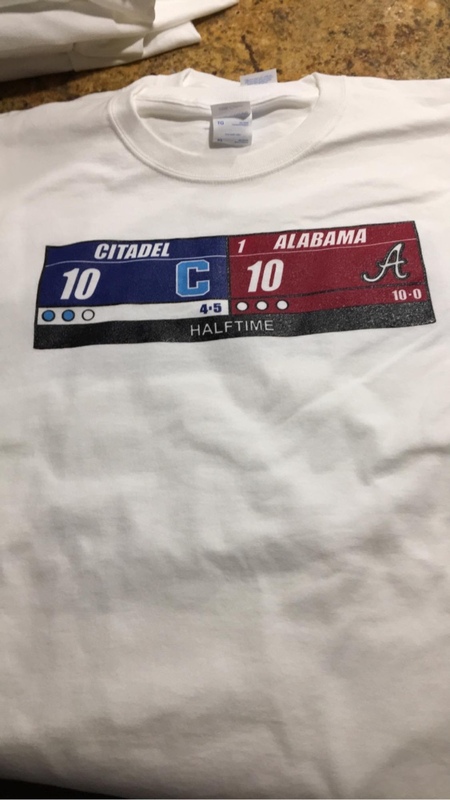 If you saw Jeff's retweet a few days ago, the Senior Private Shop did a shirt commemorating the Halftime score of The Citadel vs Alabama. We did an initial run, and after folks got them for Christmas, we did another batch due to demand. Dogfan1987 suggested I post a link here for those that hadn't seen it yet. You can grab them here. $2 from every sale goes to The Citadel Club of Maine's "Coffee for our Troops" project - sending coffee and other treats from home to deployed grads. My story, and I'm sticking with it, is that two SC teams played Alabama this season, and that The Citadel first exposed Bama, and Clemson finished 'em off. Bama had their way with everyone else, except us and the Tigers (though UGA made a good showing). Any Alabama fan (and any FBBS snob who despise FBS teams playing FCS) will say that the Tide adjusted, recovered, and blew The Citadel out. Granted, but the Dogs ran on them, and what few mention is that the highly vaunted Bama offense couldn't move much at all against the Bulldogs until the 3rd Qtr. Dog D line stuffed Bama backs at the line of scrimmage repeatedly, even better than Clemson, in spite of giving up 50-60 pounds. I still close my eyes to go to sleep at night and get images of that game floating in my dreams . . . ..